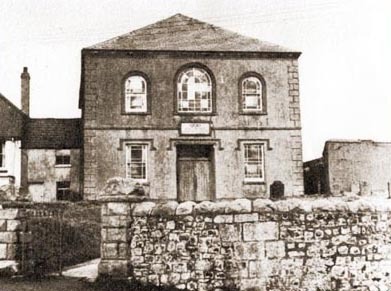 Nebo, like the other non-conformists denominations in Hirwaun, commenced as a movement/cause in the early 1800’s and they with the others worshipped in premises provided by George Overton of the Hirwaun lronwoks. In 1822, they decided to move to provide a place of their own and so by 1823 Nebo Chapel had been built. The minister during this time of change was the Rev. Joseph Harrison who also had connections with Ebenezer (W.I.) Chapel, Trecynon and he remained at Nebo until 1835. The Rev. William Williams was inaugurated at Nebo in May 1841. The original chapel was enlarged in 1836 but by 1850 the chapel had become much too small to house the congregation, so a larger chapel was built at a cost of £1,100: it could accommodate 800 people. The new building was opened on 9 March 1851. In 1853, Nebo was recorded as having a membership of 250, with 200 in the Sunday School. In 1866, Nebo became the mother church of the newly opened Mount Pleasant (English Congregational) Church. Over the following years the church flourished and was the centre of the cultural life of the village and hosted many Lectures, Choirs, Concerts & Eisteddfodau etc. In 1878, the Rev J. R. Williams received a call from Nebo to be the successor of Rev. W. Williams who had died the previous year. Noted for his powerful and earnest sermons he was most notable for his contribution to the Sunday school. After the 1939-45 War, church attendances dropped and membership gradually dwindled. By the year 2000, the building showed signs of deteriorating and required intensive refurbishment. By this time Bethel ‘s building had fallen into to disreoair so their members combined in joint worship with Nebo. Unfortunately the condition of Nebo was getting worse and in 2008 Bethe/INebo members were grateful to the diaconate of Zion (English Baptist) Church, Foundry Road in allowing them the use of their church for their services. Beth/Nebo continue to hold their services at Zion.